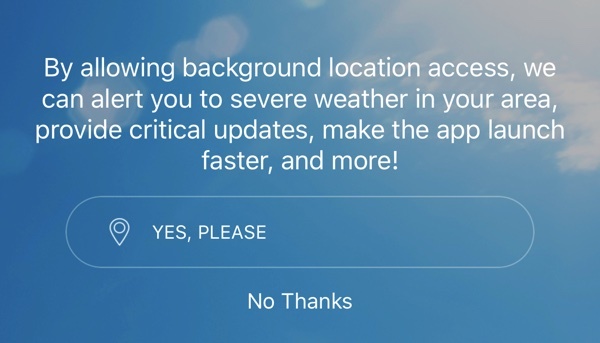 Popular and well-known iOS weather app AccuWeather has been caught collecting and sharing user location data even when location sharing permissions are turned off, according to a blog post recently shared by security researcher Will Strafach. According to Strafach, AccuWeather was partnering with data monetization firm Reveal Mobile to collect GPS coordinates, including speed and altitude, the name and BSSID of a user's Wi-Fi router, and whether a device has Bluetooth on and off, all of which was available to Reveal Mobile when location services were enabled. With location services disabled, AccuWeather was still sending the Wi-Fi router name and BSSID, which still offered Reveal Mobile location data. By expanding the use case of location data to pre- and post-shopping experiences, entirely new possibilities open up for online and offline retailers. The value lies in understanding the path of a consumer and where they go throughout the day. Traveling from home to work to retail to soccer practice to dinner is vital to knowing the customer, and represents the new opportunity of mobile location data. In response to Strafach's blog post, Reveal Mobile says the data it collects is anonymized and grouped into audience segments. "We offer no product or service that permits anyone to see an individual device's location data," reads a statement on the Reveal Mobile website. The company also says it does not reverse engineer a device's location when location sharing is turned off. AccuWeather vice president of emerging platforms David Mitchell told ZDNet that AccuWeather will use data through Reveal Mobile for "audience segmentation and analysis, to build a greater audience understanding and create more contextually relevant and helpful experiences for users and for advertiser." Following Strafach's discovery, many people have been uninstalling the AccuWeather app, and given the wealth of weather apps available in the App Store, this is not surprising. AccuWeather does not apparently have plans to end its relationship with Reveal Mobile, so users may want to find another weather app. To avoid any further misinterpretation, Reveal is updating its SDK and pushing out new versions of the SDK in the next 24 hours, with the iOS update going live tonight. The end result should be that zero data is transmitted back to Reveal Mobile when someone opts out of location sharing. In the meanwhile, AccuWeather had already disabled the SDK, pending that update. AccuWeather will work with Reveal to restore the SDK when it has been amended and will continue to update its ULAs to be transparent and current with evolving standards. AccuWeather and Reveal continue to enhance methods for handling data and strive to provide superior, seamless, and secure user experiences. Update 2: AccuWeather has updated its app to remove the Reveal Mobile SDK. "The value lies in understanding the path of a consumer and where they go throughout the day." Disgusting business practice. It's so difficult to find genuinely honest businesses these days.. This was my go to weather app. Any suggestions for a replacement? App store reviews are already getting hit hard. Well, looks like Accuweather is getting deleted off my iDevices. But we have plans for AccuTracker. Long press/click X. They'll be burned at the stake for this. Violating privacy policies already enrages people but to then sell it too is just asking for death. I hope apple ban the app.. I would expect this type of behaviour to be against t&c and this is the one of the main reasons I buy Apple devices. Deleted here, too. Not because I care about them having my location data, but because of their lacklustre response to this report. Shameful.